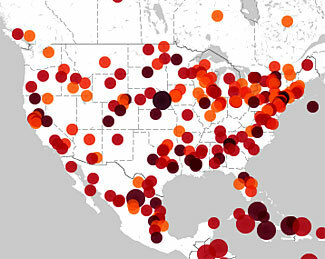 Who knew there were so many potentially significant health events in the US at present. As realistic preppers, we know that we don’t always get unfiltered ‘real’ news and sometimes there are ‘policy issues’ that intrude on how news is shaped and reported. This is particularly true of enormous potentially world-changing events. While your local newspaper can be relied upon to be first to break the story if a local cat gets stuck up a tree, and also to give prominence to news that furthers their own ideological agenda, other stories can sometimes get delayed, re-written, or totally ignored. The good news is that these days the major news outlets – the three traditional television networks and our local newspaper and radio stations – have now been eclipsed by all the other news sources out there, and all equally close to us through the internet, no more than a url and a click away. The problem is that there are so many of these second and third level news outlets, news gatherers, and news finders that they all tend to get lost in the crowd, and it is hard to know where to find reliable and timely news that is important to us. One vital thing that we as preppers are very focused on is getting early advance warning of trends and changes that may impact on our society and which may herald an oncoming significant event that might see a Level 1/2/3 scenario as a result. We like the Drudge Report for general news distribution, but his selections of articles tends to be broadly focused at more or less mainstream readers. We subscribe to a number of prepper type reader forums as well, but these tend to be a mix of rumor and nonsense, with only occasionally useful/important alerts mixed in with the other content. The current prominence given to Ebola frankly has us unsettled, but perhaps for the opposite reason to what you might think. We are puzzled why this present outbreak in West Africa is being given so much exposure and importance. Is there something the authorities know which they’re not yet telling us? Is there some other hidden agenda item? Similar issues sometimes surround other important trends and stories and developments in the world. We came across an interesting and very useful site today that automatically scans much of the internet for health related news. It is so good at doing this that it found the first stories about the latest Ebola outbreak nine days before the outbreak was labeled as Ebola, and long before the western press started to write about it. The site is www.healthmap.org. It was originally intended as a tool for public health agencies, but it is open for anyone to use and for anyone to sign up for email alerts, and most of their content is in ‘plain English’ rather than in obscure obtuse medicalese. We see on their event map (using the ‘diseases near me’ feature) that at present it is reporting on the spread of West Nile virus further into the American Redoubt (a mosquito borne virus that is taking over the world and not receiving nearly enough attention). In addition to the general map, they also have specific tracking projects for diseases such as flu, Dengue Fever (another relatively new but significant entrant into the US) and a ‘Predict’ map that apparently anticipates possible future diseases that are spread from animals to humans. A lot of good stuff. They offer a newsletter alert service that we recommend you sign up for. All in all, a great and free service that hopefully helps us to keep better informed and ahead of health/disease type issues. Thank you for a great reference for health issues. I will take your recommendations and follow them, because after an initial checking of the site I was impressed also. Thanks again. Thanks for your kind comments. I’m glad you found something of value.